Concert Photography Tips episode 7 highlights the importance of seizing the opportunities you’re given at shows. Not all shows are straightforward. Some shows throw curveballs for the audience, and for you as the photographer too! 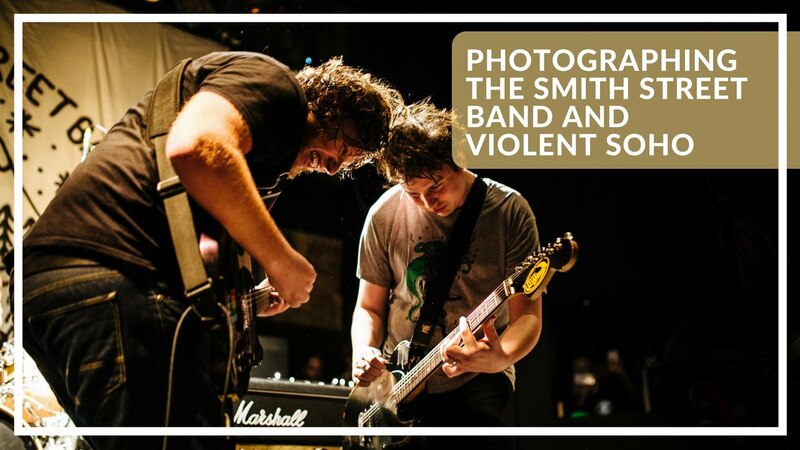 Sometimes you’ll be aware of the opportunity like I was in this video featuring The Smith Street Band and Violent Soho, but regardless of any insight you have, being prepared for anything is crucial to taking a great music photograph. If you know the band you’re photographing well, it always pays to ask them if anything special is going to happen during the gig. Are they going to be in a certain position when something happens? Is there going to be a certain guest coming out to do one of the songs with them? If you know that there is a certain instance that’s going to happen, ask which song it’s going to happen in. Make sure you’re in position and ready to photograph the event. Think about what the band might need in terms of photography when the event occurs. In this example, when Luke from Violent Soho joined The Smith Street Band on stage, it was important to make sure I got at least one Smith Street Band member with Luke. Photos of Luke by himself could have been taken at a Violent Soho gig, so it was important that at least one of the members of The Smith Street Band was present in the photo I used. Again, your feedback means the world to me! Thanks for everything you guys are doing to support the Music Photography Tips video series!